How Often Does Hydraulic Hose Replacement Need to Happen? This is perhaps the most common question that we are asked when someone comes in to ask about hydraulic hose replacement. Unfortunately, there is no date stamp on your hydraulic hose assemblies that says how long it will last. However, there are signs that you can learn to look for that will help you recognize when your Fall River hydraulic hoses are getting ready to require maintenance. If your hydraulic hoses fail, do not put an old assembly on your equipment. It can cause a lot of damage – more than you might expect. Instead, contact Metro Industrial & Marine Supply, and we can get you the hoses you need or even build a hose in Fall River to meet your specifications. According to the Society of Automotive Engineers (SAE), the average life of rubber hose is approximately ten years from the date that it was manufactured. You can see the manufacturing date on the hose along the lay line. If you are thinking about putting a hose on your equipment and see that it is close to the ten-year mark, go get a new hose instead. It will cost you a lot less to purchase new hydraulic hose assemblies than it will to clean up if the older hose breaks while on your equipment. Bad hoses can also cause damage to the various components of your system, resulting in possible injury to employees and considerable downtime. Your best course of action is to implement a preventive schedule and stick to it faithfully. For most types of equipment, a simple visual inspection can be done once each month to prevent failure. However, this can vary depending on how you use the equipment. Industrial equipment that runs almost continuously will go through hoses quicker and will require replacement more frequently. Preventive hydraulic hose replacement should occur every year or two, again depending on how the machinery is being used. In spite of knowing the average life of the rubber hose and the average length of time the hydraulic hoses can be used, it is important to continue doing regular inspections to prevent failure. One of the best ways to stay on top of hydraulic hose replacement is to keep a log. In fact, a good log can sometimes help you spot larger issues at work. 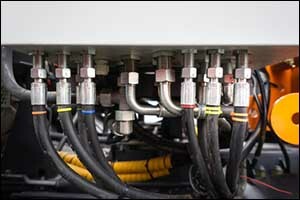 For example, if you keep a record of every time you replace hydraulic hose assemblies, you might spot a pattern of having to replace some hoses more frequently than others. Industry testing reveals that as much as 80 percent of hose failures are caused by external physical damage. That damage can be caused by rubbing, kinking, pulling, crushing, or another type of abrasion of the hose. Hoses that rub up against each other or machinery while in use could be at a higher risk of having more frequent replacements. While the log might help you spot issues, it can also indicate the average lifetime for your Fall River hydraulic hoses. Again, this should not be considered 100 percent accurate by any means, as environmental and external influences can change that might cause a hose to need to be replaced sooner. Inspections should still occur on a regular basis. But if you notice that you are changing out your hydraulic hose assemblies every 18 months or so, you know that when you put on a new assembly, that it should last you at least a year. It cannot be stressed enough though that visual inspections should still occur on at least a monthly basis. If you need to replace a hose, come to Metro Industrial & Marine Supply, and we can build a hose in Fall River according to your requirements. At Metro Industrial & Marine Supply, we go above and beyond to ensure quality products and services for our customers. We provide same-day services on our custom options to build a hose in Fall River, and we keep a large stock of hydraulic hose assemblies and supplies on-site. It is our mission to offer friendly, professional, and hassle-free customer service. We are proud to have worked with some of our customers since the day we opened and are pleased to have received so many referrals. If you are interested in Fall River hydraulic hoses or would like to know more about hydraulic hose replacement, give us a call at 508-996-8400. Our team can answer any questions that you might have and help you find the parts, products, or components that you need.